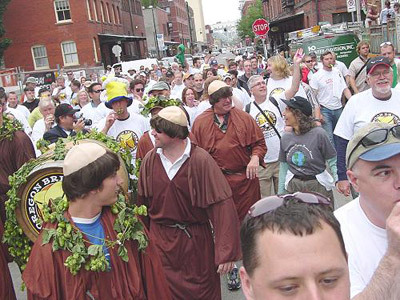 Don’t ya think every Beerfest should start with a parade? I’ve just returned from way too much fun at the Oregon Brewer’s Festival and the parade really set the mood for me. The OBF has begun with a walking parade for several years but due to excessive indulgence on my part at the brewer’s dinner and after parties the night before; I’ve never managed to drag my body from the sack in time to make it. This year I made myself a promise to join the parade. 8am Thursday morning: The birds were singing and children playing when I pried my crusty lids apart. There were a dozen or so people already at the Rogue Ales Public House on 14th & NW Flanders when I arrived at 9am for the special pre-parade Oregon Brewer’s brunch that was set to begin at 10am, and they, like me, expected a large crowd. We weren’t disappointed. By the time the doors opened I’d say there were a hundred people waiting. By the time I’d finished eating that number had doubled. Ah, there’s, nothing like a pint, a nice breakfast, and a big build-it-yourself Bloody Mary to get a growing boy off on the right foot in the morning. Many of craft beer’s movers and shakers were in attendance. Tom Dalldorf of Celebrator, the Widmer Brothers, Jay Brooks, Fred Eckhardt, Rogue’s Jack Joyce, and Don Younger of Horse Brass to name a few. The air was filled with excited chatter as we donned our official parade T-shirts and tuned up our kazoo’s. 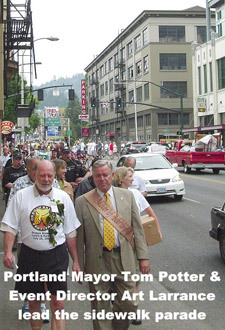 Portland Mayor, Tom Potter, would lead our raucous band on a winding journey of 18 blocks through downtown Portland to the pot-o-gold at the end, the Oregon Brewer’s Festival at the Tom McCall waterfront park. PBS was there to document the occasion as part of an overall piece on the entire event. Don Younger mentioned the folks from the Food Channel were also in town doing a piece on OBF. Mayor Potter and Event Director, Art Larrance of Raccoon Lodge Brewery led the way, followed by the wail of bagpipes from the Tualatin Valley Fire & Rescue Pipe and Drum corps, the Monks carrying the symbolic opening ceremony cask, and then the rest of us playing our kazoo’s for all we were worth. The walk was brisk and joyful; the people of Portland along the route came out of their homes and businesses to cheer us on. Before I knew it we were at the river gathered around the cask. Salivating as Mayor Potter gave his OBF opening spiel and tapped the cask. 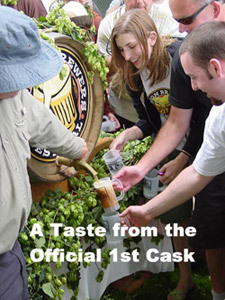 The opening beer was a tribute ale by Rogue dedicated to brewer Glen Falconer’s memory called Aged Glen Anniversary Ale. The ale was a dark amber color with a sweet malt aroma. A nice balance of caramel malt flavor and citrus hop with a mildly dry finish. Not bad guys . . . not bad at all, one of the best strong ales I tasted at OBF. I worked down the list of the OBF’s most notable beers. Next year I’ve got to remember to bring some crackers or something. After the first bad big beer I was having a hard time tasting anything while my mouth recovered from excessive IBU levels. Sorry, I may live in the Northwest but I’m not a big fan of overly hopped beer with huge IBU’s. Hops have a place in my beer and my tongue begs for a little balance and diversity . . . but that’s just me. I don’t eat habanero chili’s either. Hopworks Urban Brewery; Christian Ettinger, formerly of Laurelwood Brewery is opening his own place in Portland. Now here I’m about to contradict my previous statement. Because even though the Hopworks IPA has an IBU of 71, I found the light amber beer to be balanced and enjoyable. Flying Fish Brewery, a New Jersey brewery you don’t hear a lot about over on the right coast, brought a great beer to the table with its Flying Fish Bourbon Barrel Abbey Dubbel. This rich, complex dubbel was aged in bourbon casks. It exudes a fruity nose and generous malty body and has a dry almond-like finish with a little alcohol burn . . . gantastic! Fifty-Fifty Brewery – Donner Party Porter. Tahoe (really Truckee) is the new home of renowned Midwest brewer Todd Ashman and the Fifty-Fifty Brewery (opened in May). I’m an unabashed fan of the porter style and the Donner Party Porter lives up to Todd’s reputation for well planned, impeccably brewed beers, I look forward to the aged porter that’s in Jack Daniels barrels now, but it’s hard to imagine how this could be a better. Lompoc Brewing – SummerAid, a light golden ale, so easy on the palate, a perfect cleanser after too much big beer on a hot day. There you have it, my take on the offerings at the 2007 Oregon Brewers Fest. No I did not try all 73 beers, but I did make a dent in that list. Editor’s note: This was probably the most blogged about festival ever. The Beervana wrapup will lead you to more blogs or visit RSBS and look for OBF posts. The Midsummer’s white was one of the big winners at the fest. Far better than the two imperial whites by Stone and Widmer. Proof that bigger ain’t always better.